Thiruvananthapuram Business Directory or Trivandrum Business Directory is the yellow pages directory listings of Trivandrum based businesses, shops, showrooms, service providers and companies. Businesses listed in this Thiruvananthapuram Yellow Pages website will help you to find services in your area. 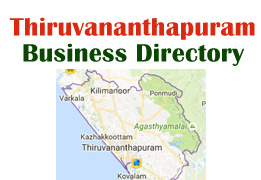 To ADVERTISE YOUR BUSINESS in Trivandrum Business Directory contact us at trivandrumbusinessdirectory@gmail.com.